A typical serving of gudeg. 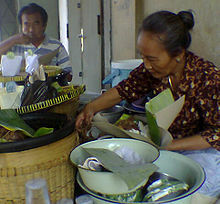 A street stall of a woman selling gudeg. Gudeg is a traditional Javanese cuisine from Yogyakarta and Central Java, Indonesia. Gudeg is made from young unripe jack fruit (Javanese: gori, Indonesian: nangka muda) stewed for several hours with palm sugar, and coconut milk. Additional spices include garlic, shallot, candlenut, coriander seed, galangal, bay leaves, and teak leaves, the latter giving a reddish-brown color to the dish. It is often described as "green jack fruit sweet stew". Served solely, gudeg can be considered as a vegetarian food, since it only consists of unripe jackfruit and coconut milk. However, gudeg is commonly served with egg or chicken. Gudeg is served with white steamed rice, chicken either as opor ayam (chicken in coconut milk) or ayam goreng (fried chicken), telur pindang, opor telur or just plain hard-boiled egg, tofu and/or tempeh, and sambel goreng krechek a stew made of crisp beef skins. There are several types of gudeg; dry, wet, Yogyakarta style, Solo style and East Javanese style. Dry gudeg has only a bit of coconut milk and thus has little sauce. Wet gudeg includes more coconut milk. The most common gudeg comes from Yogyakarta, and is usually sweeter, drier and reddish in color because of the addition of teak leaves as coloring agent. Solo gudeg from the city of Surakarta is more watery and soupy, with lots of coconut milk, and is whitish in color because teak leaves are generally not added. Yogyakarta's gudeg is usually called "red gudeg", while Solo's gudeg is also called "white gudeg". The East Javanese style of gudeg has a spicier and hotter taste compared to the Yogyakarta style gudeg, which is sweeter. 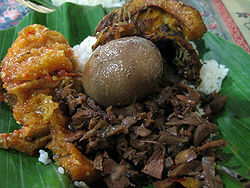 Gudeg is traditionally associated with Yogyakarta, and Yogyakarta is sometimes nicknamed "Kota Gudeg" (city of gudeg). The center of Yogyakarta gudeg restaurants is in the Wijilan area to the east side of the Yogyakarta Kraton (Sultan's palace). Gudeg can be packed into a besek (box made from bamboo), kendil (clay jar), or canned. Canned gudeg can last up to one year. Today, warung and restaurants serving gudeg can be found throughout Indonesian cities, such as Greater Jakarta. It is a popular dish in Javanese restaurants, and can be found in neighboring countries, such as Singapore. ^ Indah Setiawati, ''Gudeg' unwrapped', The Jakarta Post, 28 October 2012. ^ "Singapore - White Curry Jackfruit (Gudeg Putih)". This page was last edited on 17 March 2019, at 05:08 (UTC).